In declaring that Jerusalem's conquest "will not be done through negotiations," Badie was effectively repeating Hamas's rejection of peace talks between the Palestinian Authority and Israel. This stance should come as no surprise: Hamas is, in fact, the Palestinian branch of the Egyptian Muslim Brotherhood, as stated in Article 2 of the Hamas charter. Badie's comments are only the latest in a series of warning signs from Egypt. At a Muslim Brotherhood election rally held earlier this year, an event attended by Mohammed Morsi shortly before he became president, a cleric hailed the Brotherhood's candidate as a leader who would work to ensure that "our capital shall not be Cairo, Mecca, or Medina. It shall, Allah willing, be Jerusalem. Our cry shall be: Millions of martyrs march toward Jerusalem." As Morsi looked on smilingly, the cleric told the crowds that, "We can see how the dream of the Islamic Caliphate is being realized, Allah willing, by Dr. Muhammad Morsi and his brothers, his supporters, and his political party. We can see how the great dream, shared by us all  that of the United States of Arabs ...shall, Allah willing, be restored. The United States of Arabs will be restored by this man and his supporters." 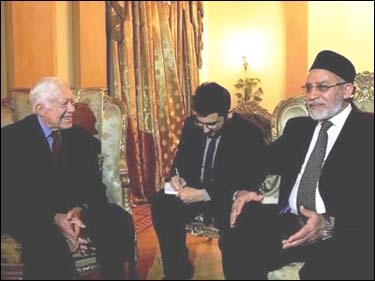 Although some commentators dismiss Badie as unrepresentative of the Morsi government and therefore not to be regarded with particular attention, this could well be a potentially lethal mistake, and one which plays into the Brotherhood's efforts to deceive Western governments and opinion makers. Morsi's "Freedom and Justice Party," the Brotherhood's political entity, proudly features interviews with Badie on its website. This working arrangement between Badie and Morsi allows Badie to issue frank, ideological statements  utterances that Morsi could not presently say for fear of losing U.S. financial aid. The arrangement is comfortable for both Morsi and his Muslim Brotherhood movement. The Egyptian president can focus on securing loans for the Egyptian economy while making vague, conditional references to maintaining the peace treaty with Israel  thereby keeping US aid money coming in  as senior officials from his movement can prepare the Egyptian public with a stream of bellicose rhetoric, for the future severance of its ties with Jerusalem. The Muslim Brotherhood has waited for this moment for more than six decades. It has spent years creating a strong base of support among Egyptian society, while waiting for Egypt's secular autocracy to crumble. It patiently gathered followers by creating a network of medical clinics and centers, providing aid to the needy, and spreading Islamist ideas to the poor. It was this network that allowed Morsi to win 52% of the vote in the presidential elections, and that paved the way for Islamist parties to win two-thirds of the Egyptian lower house of parliament. Now that the Islamists have secured a majority on the panel tasked with drawing up Egypt's new constitution, it should not surprise anyone that they are proposing articles that will ensure Egypt's transition to an Islamist state. The proposals being produced by the panel have Egyptian liberals up in arms, and helped to fuel the recent violent clashes between the supporters and opponents of Morsi in Cairo. The Islamist panel members are seeking to impose the strict enforcement of Sharia law in the constitution. The finalized draft will be put to a national referendum, and, if passed, will mark another milestone in the transformation of Egypt into a hardline Sunni state. These developments have a direct bearing on regional security. Hamas in Gaza is greatly encouraged by the Islamist ascendency in Egypt, and is expecting Cairo to be its principle future patron, in the place of Iran and the crumbling Syrian regime. Meanwhile, Egyptian security forces in the Sinai Peninsula are failing to take sufficient action against the mushrooming Salafi jihadi groups  the same elements that are increasing their presence in the Gaza Strip. The ongoing rocket attacks and cross-border infiltrations by al-Qaeda-inspired elements in Gaza and Sinai are forcing Israel to take action in the Strip, thereby raising the overall chances of a conflict with Hamas. Should Hamas become involved in a new major conflict with Israel, that could trigger a further deterioration with Egypt  a situation which, in the short-term future, Egypt's Muslim Brotherhood would prefer to avoid. Both Hamas and the Egyptian Muslim Brotherhood dispute the doctrine of immediate jihad pursued by the Salafi jihadis; they appear to prefer instead to focus on consolidating their newly found political power before confronting Israel. As the Muslim Brothers keep repeating, at least for now, they seem to be planning to seek conflict with Israel only after they have completed the Islamization of their societies at home. http://www.memritv.org/clip/en/3614.htm. A video is available here.